Poliomyelitis, popularly known as polio is a crippling, infectious and potentially harmful viral infection transmitted by the poliovirus. The virus can spread from a person to another and acts swift once in the body, infecting the brain and spinal cord. The result is paralysis and potential death. Even though the virus isn’t common in most developed countries, polio could me a menace to people who travel out of the country often. The primary mode of transmission is via person-to-person contact. The virus resides in the human mouth or intestines meaning that it can be transmitted through contact with human excrement even in the tiniest bit. A less common infection route is by inhaling sneeze or cough droplets. Any traces of feces in your hands when touching your mouth or putting infected items like toys into your mouth could lead to an infection. Since infected people can be carriers for up to two weeks, it is hard to know who to avoid as apparently healthy people could be a threat. This combined with the fact that the virus can live out of the human body for weeks means that the risk of infection from contaminated food or water is very high especially in low sanitation areas. These symptoms could linger for a week or so before they ebb depending on whether your immune system was strong enough to fight off the virus or not. Paralysis is the worst of the poliovirus infection symptoms. If the patient is lucky, the paralysis could affects limbs leaving the person disabled. In rare but more severe cases, the virus could affect core muscles, for instance muscles controlling your breathing hence leading to death. 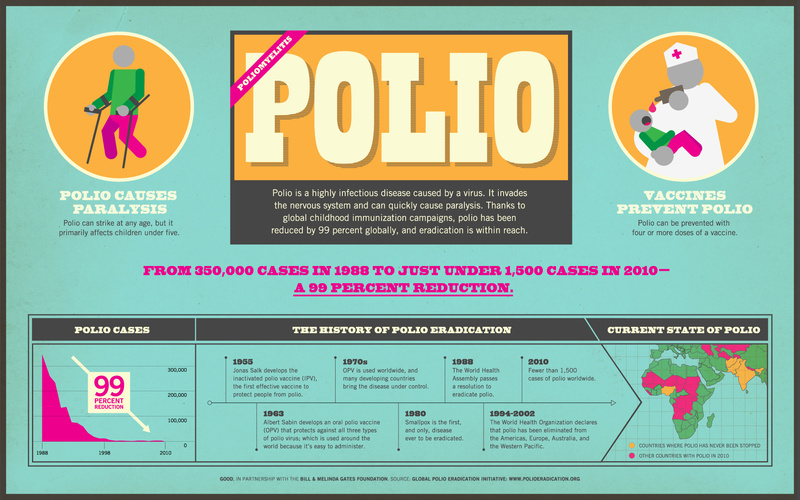 When Does the Poliovirus Infection Become Polio? Poliomyelitis, by definition, is a paralytic disease. Consequently, only people whose poliovirus infection results into paralytic disease are technically considered to have the disease. With no actual control over how the virus will react once in the human body, it is always safe to stay clear of the virus. While things like improved sanitation and personal hygiene might reduce the spread of the virus, it is wise to take the polio virus at the designated times. There is a total of four shots in the regime. Adults could also consider taking the vaccine when traveling to high prevalence areas. Even though the immunity gathered from childhood vaccines would be enough to keep you safe as long as you live, it would do you no harm to get an extra shot when you can.